We know that excessive fat intake causes excessive weight gain and obesity. But do you know there are "good" fats and "bad" fats? Most of us get confused. Here are some facts. 1) Contributes to the energy needs of a person. 2) Provides essential fatty acids (EFA) that cannot be made by the body. 3) Promotes absorption of fat-soluble vitamins (A, D, E and K). 4) Improves the taste and flavour of food. - fatty acids attached to it. Fatty acids are composed of varying numbers of carbon and hydrogen atoms. 1) Saturated fatty acid (SFA) - when all bonds joining the carbon atoms in a fatty acid molecule are single (saturated) bonds. Eg. beef or mutton fat, pork fat, coconut oil. 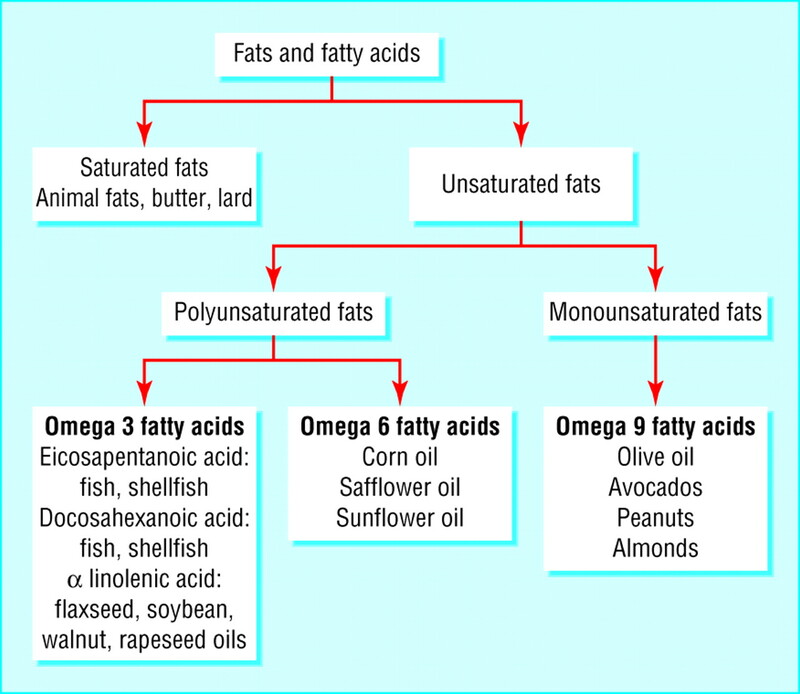 2) Unsaturated fatty acid - when 1 or more double (unsaturated) bonds occur in the fatty acid chain. Eg. olive oil, soya bean oil, palm oil. (i) Monounsaturated fatty acid (MUFA) - 1 double bond. 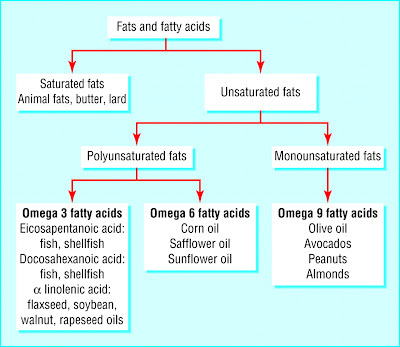 (ii) Polyunsaturated fatty acid (PUFA) - more than 1 double bond. Hydrogenation - an artificial way to "saturate" an unsaturated oil so as to make it harder, by adding hydrogen to the double bonds in polyunsaturated oils. Eg. margarine. Trans fatty acids (TFA) or trans fats are thereby formed. TFA have been shown to have harmful effects on human health, especially in increasing risk of coronary heart disease. 2) to manufacture bile acids, steroid hormones and vitamin D.
Cholesterol is found only in foods of animal origin, eg. egg yolk, butter, meat, seafood, milk. (i) Cholesterol from diet plays only a minor role in increasing blood cholesterol. Unless a person has high blood cholesterol, don't be overly concerned about cholesterol from the diet. (ii) Most of our body's cholesterol is manufactured in our liver. The healthier is our liver, the better our cholesterol level should be. If we have fatty liver or raised liver enzymes, our liver usually make greater amounts of triglycerides and LDL "bad" cholesterol. Our liver is the main fat burning organ in our body. If we have a fatty liver then our liver is storing fat, not burning fat. How do you keep your liver healthy? Take Lingzhi / Ganoderma. Email me at laifuiping@gmail.com to buy. Click here to refer to Shuang Hor company website for Product Description and Price.